There’s likely to be a Spanish report on Fernando Llorente every day this month, or at least until he leaves Tottenham Hotspur should a transfer happen. Marca’s New Year’s Day edition had an article explaining a return to Athletic Club Bilbao is closing in and that Spurs are looking to get rid during the January window. 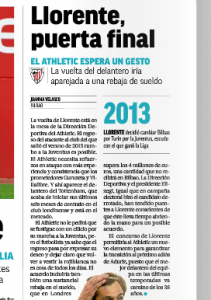 On Wednesday, they again suggest Tottenham are pushing for the player’s exit, explaining Llorente is ‘on the market’. Again, that may be a little optimistic from a Spanish perspective, with Mauricio Pochettino likely wanting a replacement for his squad first. Llorente, whose contract with the Premier League club expires in June, will have to take a ‘substantial salary reduction’ if he’s to complete the Basque return. Marca say bridges are being built following the player’s difficult exit to Juventus, and it’s been taken into consideration that the footballer has repeatedly held his hand out and spoken about a return. This transfer may be harder than the Spanish media expect, and there’s still no estimate of transfer fee.